The financing of the project will be done with 50:50 debt-equity ratio. The company will manage the debt requirement of the project from the Employees Provident Fund (EPF) for which tri-partite loan arrangement has been signed between EPF, CHCPL and RGHPCL on 2068/08/22. The equity investment will be made through 51% promoter share and 49% public share. 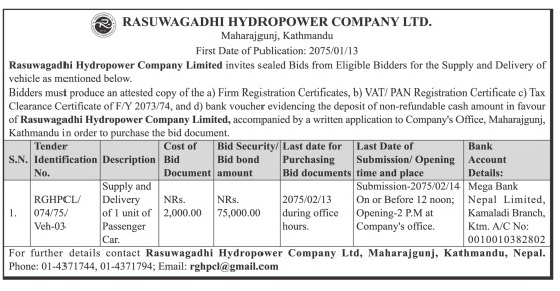 Prospectus of Rasuwagadhi Hydropower Company Limited for the Issuance of 2nd lot public share. 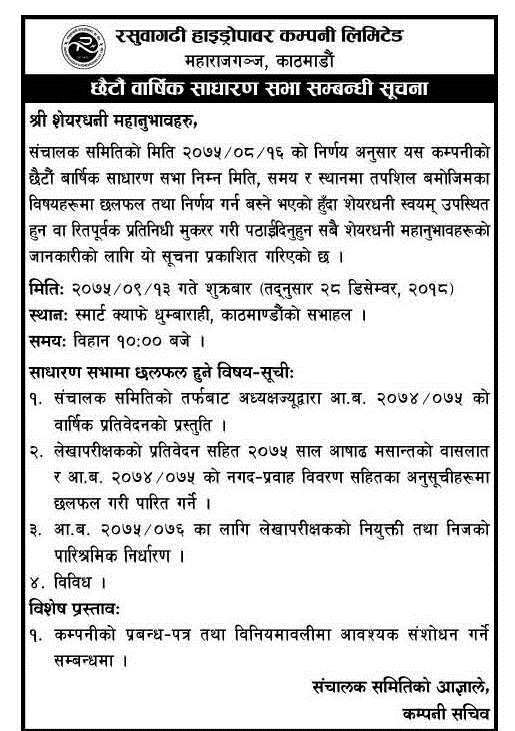 Notice for 6th Annual General Meeting which is going to be held on Friday, 13th Poush, 2075 from 10 AM at Smart Cafe, Dhumbarahi, Kathmandu. 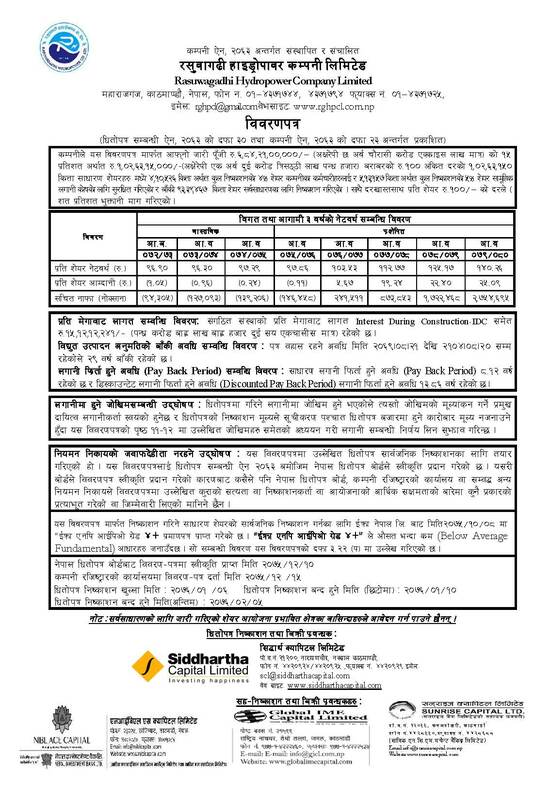 Notice Published on Aarthik Abhiyan National Daily dated 2075-08-20 (Thursday). 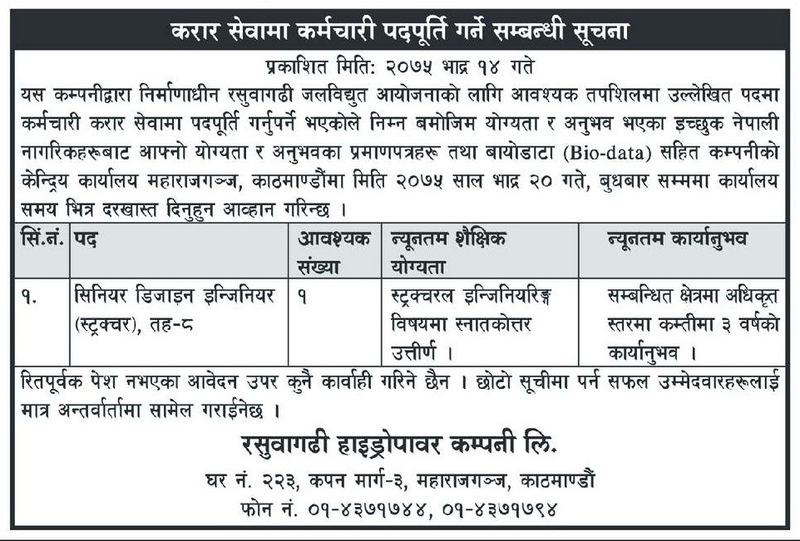 Tender Notice Published in Naya Patrika National Daily dated 2075-01-13 for the purchase of 1 unit of Passenger Car. The company has the equity structure with share investments of 51% as a promoter share and 49% as a public share. As a promoter, Chilime holds majority of the shares with 33% share holding and NEA with 18% shareholding. 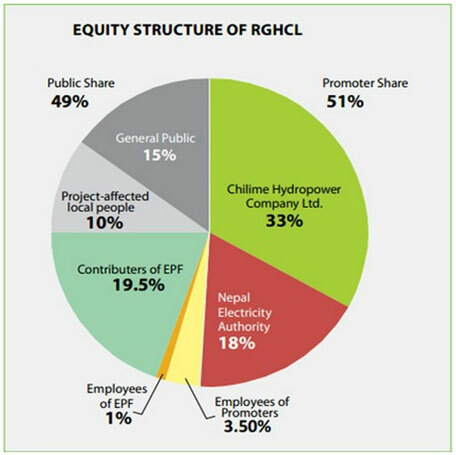 The company has aimed to develop Rasuwagadhi Hydroelectric Project having capacity of 111 MW. 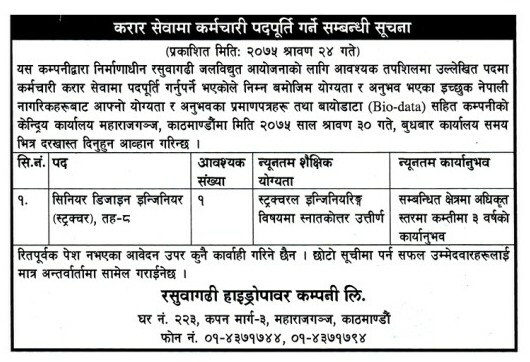 It is located in Rasuwa district, Bagmati Zone of Central Development Region. The project is accessible by the Kathmandu -Trisuli - Somdang road at a distance of 130 km to the north of Kathmandu to reach to Syabrubesi and then around 16 km from Syabrubesi to the project site at Rasuwagadhi.